Appreciation Day! This was a hard task! I have several people on the design team that I visit their blogs on a regular if not daily basis. So for today's challenge, I chose Michelle Wooderson and her project here. 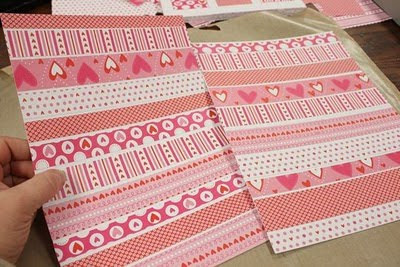 Now, I did not make bookmarks but I was inspired by this post and made a card with some of my pattern papers from PTI!! I really liked that she chose various patterns and adhered them for her bookmarks! 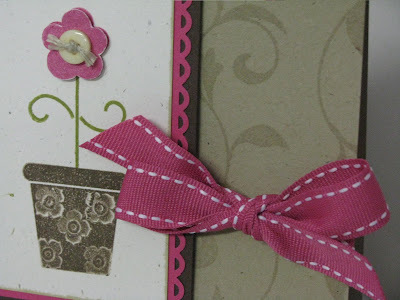 So, without further delay, here is my card for the blog hop! It had been awhile since I pulled this paper stack out and had forgotten how pretty they are! Just several different papers cut into strips and adhered to a Raspberry Fizz base. turned out so cute! 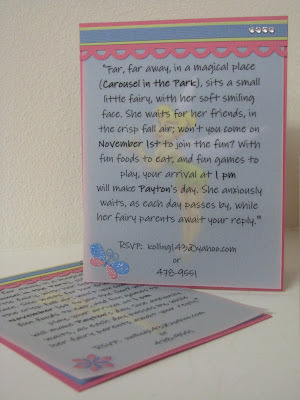 My hubby did NOT like that it says "her fairy parents await your reply"!!! 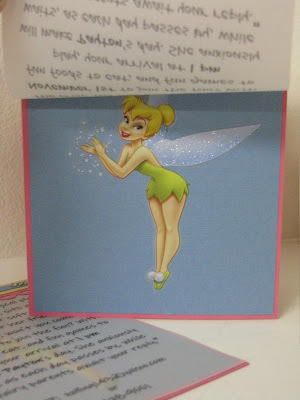 see Tinkerbell behind the writing! Kinda cool! Here's a view of the sticker behind the vellum. Hope you are having a wonderful week staying warm!! If you have been following my blog, you know that I've been making my kids cards for the different holidays now in the 3x3 size for awhile. They fit perfectly in those little mailboxes from Target! I altered a mailbox for each of them a couple of years ago. They turned out so cute! Well, here is their Valentine! I am just in love with Smokey Shadow paper! I think it looks great here paired with Scarlet Jewel! Here is a picture of their mailboxes in case you hadn't seen them! Yesterday, the kids were so funny because they asked, "Are you going to put something in our mailboxes for Valentine's Day tomorrow?" *******We did make it back from our cruise. However, we had quite a time traveling back due to SNOW weather with connecting flights EVERYWHERE!!! We actually wouldn't even be back yet if we hadn't been resourceful! When we arrived at the airport, we were told that our flight had been rescheduled for Sunday night! (that's tonight!) Well, we made it back in about the same amount of time it was originally would have taken us! Just a cab ride, different airline, and rental car later! we leave on our Bahamas cruise!! We are getting out of Kansas for a few days and escaping the cold weather that is settling in for a while!! 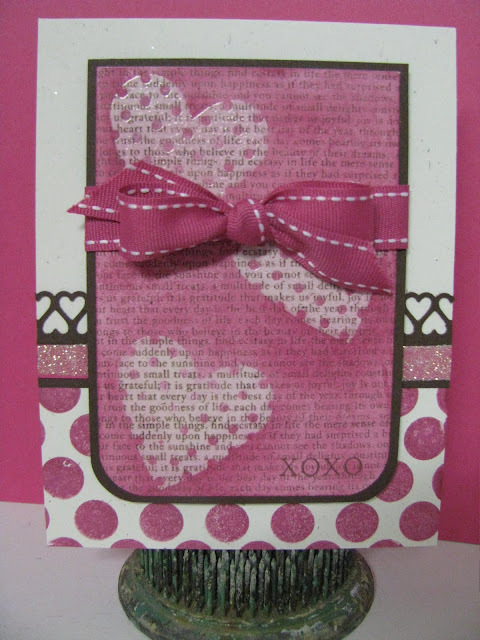 Here is a card I made while at my Stampin' Away weekend. The main thing I wanted to point out is that I used the "kissing" technique here on the flower pot from the stamp set Green Thumb! I thought the little flower from Petal Power went with this so cute! Not real fancy here but I like the results! Here is another view a littler closer up! Enjoy!! Have a fabulous week and I'll see you again when we're back from our cruise!! All products PTI unless stated. Oh, the festivities over at PTI are just so much fun!! Today Nichole Heady posted a new feature coming soon: a weekly technique challenge! So, we start off with an Emboss Resist technique! It has been a long time since I've tried out this technique...but the results are stunning! Here is my entry into this challenge!! 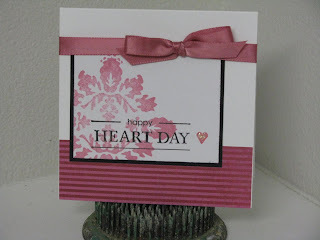 I used my one of my favorite sets: Heart Prints for this challenge as well as a new MS border punch! Don't you think that bow is just wonderful? I am getting much better after watching Dawn's bow tying video! You've got to check it out if you are having trouble tying bows!! Here's is another view of my card. I wanted to share another card I made during our Stampin' Away! This one is for a dear friend that just happens to be my "boss"! She LOVES dogs.....I mean LOVE!! Well, while I was at my stamping weekend, she got wonderful news!! She passed the CNN!! I am so proud of her! So, without further waiting here is a cute little card I made for her in Congratulations! I just love this little dog stamp!! 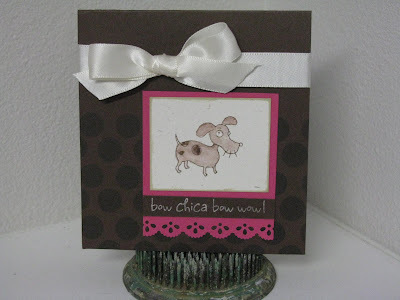 It is a newbie from TAC called Animal Thoughts (the sentiment is also a new stamp set called Bow Chica Bow Wow). 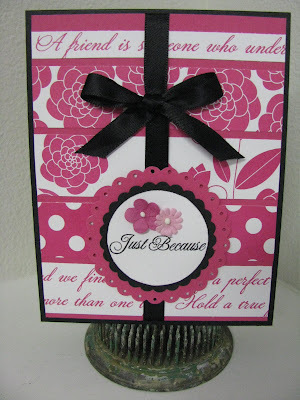 I used a new MS border punch here called Pinking Scallop. 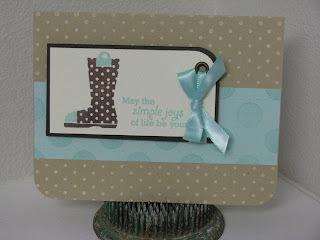 As promised, here are the ShoeBox projects that we completed while at Stampin' Away! First up, is the card I designed as my project. The inspiration for the colors for this card, admittedly came from a SU flyer. But the goodness on the card is ALL PTI!! 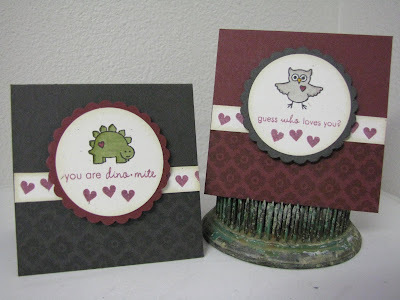 I think I am in love with these Button Bits stamp sets! This flower image just sold me on this set and you don't even have to use buttons for it to be useful! Really, nothing fancy here on my card but I really like how it turned out especially with that large sentiment! Next up, is the card designed by Jen Carter. This card uses PTI goodies as well starring Green Thumb. I don't personally own this set so it was so much fun to stamp with it! I used her set to make another card that will be posted at a later date. 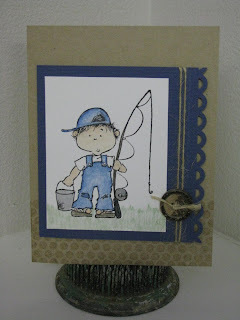 Next, is a card designed by Barb Foster. Her card uses a very popular TAC set called Victorian Elements and the rock 'n roll technique. Very fun and I love the results!! Next up, is a card designed by Laurie Willison. Her card uses a stamp set from TAC as well called Wonder and Joy. And if you like to color, this is a set for you! I got in on using OMS and Prismacolor pencils for coloring this one! I stamped off some other images from this set (thanks Barb) so that I can practice some more coloring! 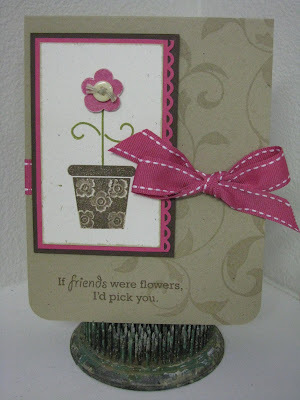 Lastly, is a card designed by Brenda Hauff. This card uses a stamp set from TAC too! This set is called Dear Friend. Here I used a different coloring medium: Copics!! I need lots more practice but it turned out so pretty! All products PTI unless noted. Well, my absence from the blog world has been because I had a FANTASTIC weekend of Stampin' Away (that's what I am calling it!! )a with friends Laurie, Barb, Jen, and Brenda! Barb and I had to travel to get there but we made it even in the convoy of blowing snow!! I have come home refreshed and inspired from this wonderful time with my friends! We made some wonderful shoebox projects (which I will show you at a later post) and just had open stamp time! 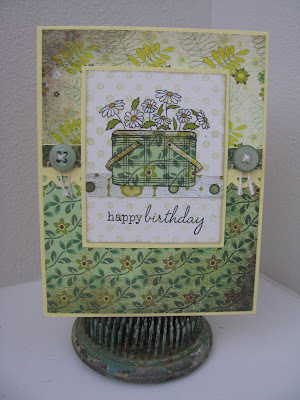 I wanted to show you this card I made while there using PTI's Vintage Picnic set. Since it was so snowy, I just had to make something cheery and springy!! 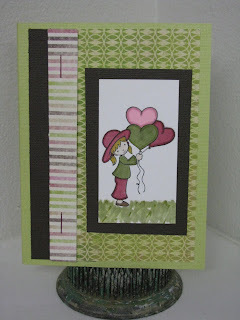 This card also uses pattern paper which I don't do very often. This is from the Origins line from Basic Grey. I fell in love with these colors when I laid eyes on this paper at Archivers a few weeks ago. I was going for a vintagy (is that a word?) look here. I just love how this turned out!! I first put together my background piece of patterned papers. Then I went to work on that cute basket. I knew I wanted to paper piece that basket the first time I ever saw that image! The "lid" and handles are paper pieced separately using scraps of Basic Grey from the background papers. 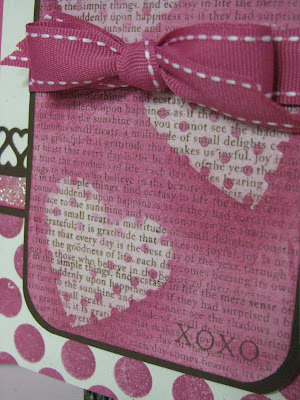 I'm not sure if you can tell or not but I lightly stamped polka dots in the background using Spring Moss ink. 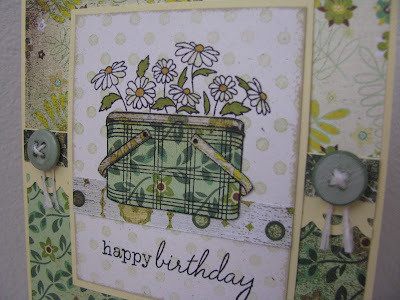 Then I stamped my daisies over the polka dots. Using some Copics, I colored the centers of the daisies and the leaves. 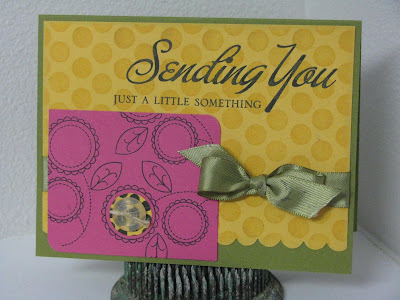 After using my Tea Dye Duo inks to outline the edges of the panel, I layered the basket panel on Lemon Tart cardstock. Finishing this card up, is a punched Apron Lace border flanked with some non-PTI colored buttons with button twine. Thanks Laurie for the buttons! Thanks for stopping by blog!! Have a great week!